Now it's time to write our architectural design brief. That's a bit of a grand name for it. 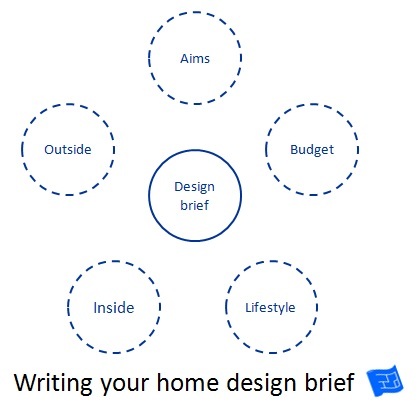 I guess it's a home design brief of a house design brief. I'll give you the inside scoop on what we asked our architect to design for us. Before we get on to the design brief let’s have a look at some of the opportunities and challenges presented by the existing floor plan and elevations. In a few cases the opportunity is also a challenge – that’s how life is! There are also a few decisions to make at this stage. We spent a long time looking for a house with a back garden to the south. It’s a wide site so there’s plenty of room to build new rooms that can also face south and take advantage of views to the garden. I love the stairs. The way they wrap around is a real ‘wow’ feature. The house was built in the 1940s and although art deco had strictly been and gone by that stage I’d like to include some features that will give the house an art deco feel. We like the way you can see through to the garden from the front door. The challenge with this is that that room needs to be kept tidy. I love attic but the shallow pitch of roof means that attic doesn't have height to become a 'livable space' so possibilities are limited. The corridor sized spaces at the north of the house are a bit of a design challenge. There isn’t much privacy behind the front door because here isn’t really a lobby area before entering the main part of the home. The front door opens right into the heart of the house. The position of gates means that they look in on principal rooms. Looking at the existing plans gets the brain thinking over a few decisions. Which side should the kitchen be on? We think the East. I’ve been in a few houses facing south in the same way that ours does and the kitchens tend to be on the east side. The design brief includes a ‘bump out’ to provide garden views from the inside. The best place for this would also be on the east side. This would create a sheltered area for outdoor seating and wouldn’t create an undesirable shadow in the evening as the sun sets in the west. If the kitchen is going to be to the east it makes sense to us that the garage will be as well. The other decision to make is whether the garage will be set to the front of the house or set back in the garden. If it’s set back any design needs to leave adequate space for a car to get to the back of the house. I think we’ll let the architect handle that one. Are there any pieces of furniture that really need to have a place? There are some but I don’t want furniture to dictate this design. Having said that I know I will find it hard to let go of certain pieces that feel like they’re part of the family. To help our architect along we write a design brief. When it's finished our home will be larger than we need. There are several main aims for our project. The current house needs modernising. It's cold and the fittings are old. To provide bedrooms for visitors which come for several days at a time because they're often from overseas. To create more open plan living downstairs. A study or home office. One needs to house printer, shredder, filing. Need some book storage in each space. Good sized laundry (enough for washer, dryer, drying cupboard, room to iron, access to outdoors) – downstairs and possibly doubling up as butlers pantry. Kitchen / dining / family room. Would like the family room to be able to be closed off for a kids TV and computer room downstairs – small room, maybe with glass wall so can see but not hear. Master bedroom with separate dressing area – get up and go to bed at different times. Bedroom needs to be at an end of the spaces – ie no going through the bedroom to get into the dressing room. Would like a separate toilet room / cubicle. Want to keep a dining space separate from the kitchen. More light coming in over the stairs. Widen / move gate posts at front. Widen / move gateposts at the front. Patio area to the back. Parents and 2 boys. Have parents visiting several times a year, have bigger groups rarely. Meg and Jonathan get up at different times and sometimes go to bed at different times. Piano needs to be in a space where doors can be closed for lessons and doors can be left open to monitor practice. We often ride bikes to school / work. We have 6 bikes at the moment – might get more. We use the car on a daily basis. Want to be able to keep an eye on what the kids are doing on video games and computer. Like getting up in the morning and reading looking out over the garden, or outside in summer. Want to watch in TV in main living room but would like to hide it away sometimes. 9 - What is a Quantity Surveyor?